AFTER DARK: Jeremy Thornton with a mulloway from the Barwon River estuary. The Barwon River estuary produced mulloway to more than 1m in length over the past week for keen anglers fishing after. Rob Thornton and son Jeremy fished the area known as The Thunderbolt over the weekend with fresh squid and live mullet as bait. With baits in the water well before the high tide change, it wasn’t until an hour after the change that their rod buckled over with a mulloway of around 60cm engulfing the live mullet. 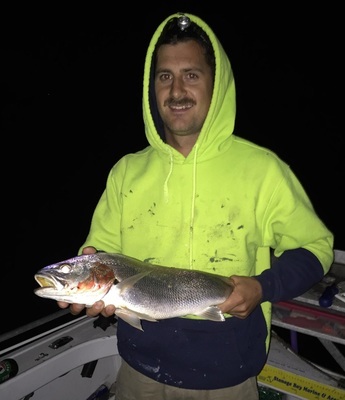 Other anglers reported taking mulloway on squid and livies while fishing a tide change after dark. Offshore angling remained the main attraction, with the kingfish numbers only increasing. Casting stickbaits or trolling small squid skirts with a strip of squid flesh pinned to the hook worked but using bait seemed the most effective method, with a live slimy mackerel or whole small squid dropped down into a light berley trail working well. Most reports come from the area between just outside The Rip to Torquay. Big Australian salmon were also present offshore, with fish to 4kg caught as kingfish bycatch. At times they were easily located when chasing bait on the surface, with anglers casting metal lures or soft plastics onto the commotion catching plenty of fish. Anglers fishing from the beaches and rock ledges along the coast found salmon to 2.5kg. Casting metal lures from 40g to 80g or using half pilchards as bait resulted in quality bags of up to a dozen fish. The Bellarine Peninsula continued to fish well for whiting and squid anywhere between Clifton Springs and Queensclifft. John ‘The Jigman’ Didge walked along the new Portarlington harbour while casting soft plastics into the deeper water, having no issues hooking into some nice pinkies. Flathead, trevally and, occasionally, snapper to 5kg were also caught. WurdiBuloc Reservoir made the report this week, with the redfin coming on the bite for anglers casting lures off the west rock wall. Early mornings and late afternoons were ideal, with fish to 40cm taking on Paco spoons and Norries Wasabi spoons. The occasional brown trout to 1.5kg was also taken at the reservoir.